Today, while discussing the GOP’s ongoing battle to replace Obamacare — the health-care vote will be “very close” — at the White House, President Trump sported a button over his suit. A button declaring his love of trucks. 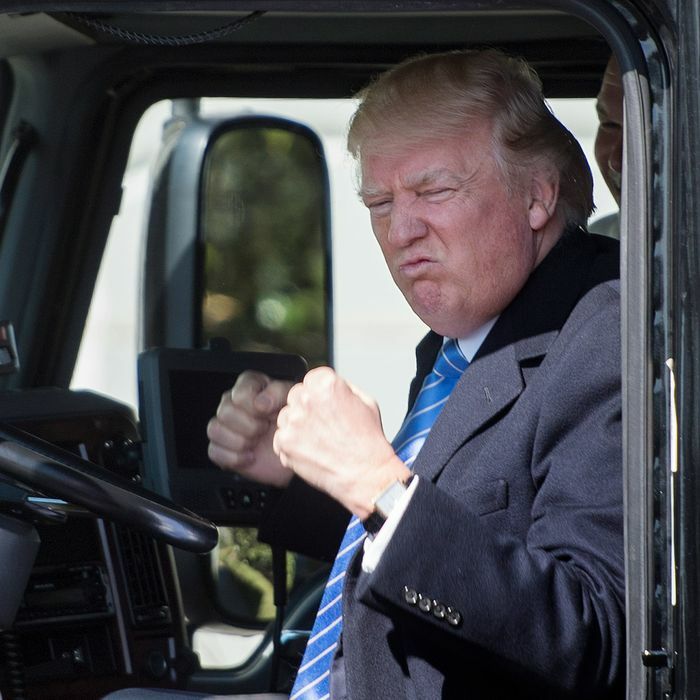 As his fellow Republicans frantically attempted to salvage a rapidly disintegrating health-care process, President Trump also found time to pop into an 18-wheeler parked in the White House driveway and give the horn a good honking earlier today. Toot, toot! Which, naturally, was all the fuel Twitter needed to meme the crap out of Trump’s newly broadcast love of trucks. Because when you think truck lover, you think Donald Trump. Donald “Truck” Trump. President Truck. I like big trucks and I cannot lie. Perhaps the next White House movie night will feature a screening of Monster Trucks. Seems pretty in line with his previous cinematic taste for children’s movies.